It is extremely rare for someone to not like fighting games. The thrill and action really does get on everybody. Every game has a unique story that one loves to follow and be a part of, especially when you get to be the hero. 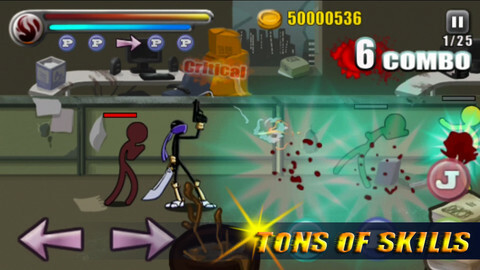 Ultimate Stick Fight is one such iOS app game that offers fun, laughter and action, all in one. 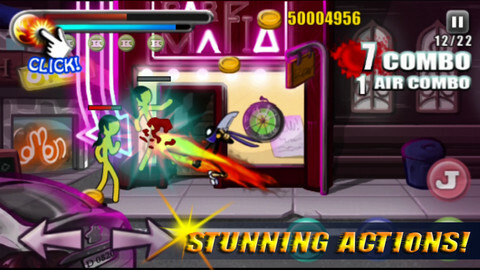 Ultimate Stick Fight will take you down memory lane and help you rebuild some memories that shall last for a lifetime. It offers you 40 stages that span 8 unique environments. You have an option to choose between the three difficulty levels too. However, unlike other fighting games, this game has a twist. You play the game as a kung-fu stick man and fight all odds to stick right through the game. In this game, you have to keep upgrading and polishing your abilities as you progress through the game. This is to be done with the coins that you earn from fighting. The game is easy to get, thanks to the extremely simple and intuitive controls. Once you begin playing it and get the knack of it, you sure will get addicted to it. Ultimate Stick Fight has two characters: Ryan and Slash. Ryan is a plain kung-fu only stick. Slash has a sword and a gun so the range of attacks is wider. The story begins with an evil entering the story, like all fighting games. 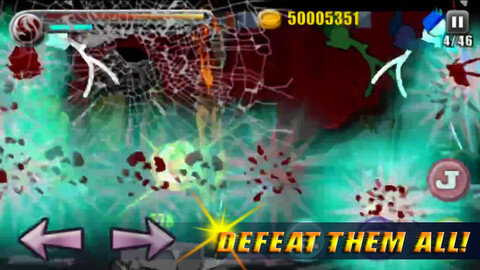 Before you begin the game, you’ll be guided through the levels and the controls. This is very useful for beginners. Mastering the controls is an easy task and takes barely any time. You have to fight enemies that are stick figures of various colors too. There are many combos to empower you. Including P-P-P-P or P-K-P-K and advanced ones that can help you cause large scale destruction. As you proceed along the game, you can unlock new combos and upgrade your abilities. Thus, your stick man becomes stronger and more capable. Also, you can pick up items to use as tools during the game. There is also a flame icon in the game that allows you to perform massive attacks to wipe out all enemies in your vicinity. If you wish to win the game, then you have to collect coins at the end of every level and use these to upgrade yourself. 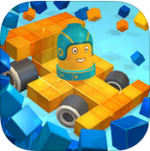 The game is simple and kind of basic but is focused on fun entirely. With the easy controls, action becomes all the more enjoyable. Unless you being exploring what the game has to offer to you, you’ll end up getting bored. The background and characters have been designed well. The best part is that you do all your fighting with a wide grin on your face that makes you simple feel great. The movement is restricted from side to side, which works splendidly for mobile devices. This game has a unique concept that makes it worth playing. At times, it might seem to get a bit repetitive and boring unless you are an action lover and are ready to keep exploring new options. A few of the upgrades might cost you a lot and will require a lot of work. The controls are neither too complicated nor too simple and work just perfectly. The game has a lot of replay value and is addictive for action lovers. Bad: Some of the controls are expensive and the game might seem to get repetitive. MEGA MERGE (MERGE IT) – ABSOLUTELY NEW IN THE MARKET!